Do you have experience with foreign students? Yes, I have worked as a Spanish teacher for foreign students for over 20 years. What are the 'À la carte' classes? In ‘À la carte’ classes you choose what you want to study, be it grammar, vocabulary, practising writing, pronunciation, listening skills, etc. Can you give Conversation classes in 'À la carte' classes? No, that is why there are specific Conversation classes. 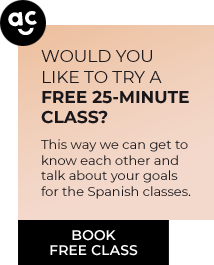 Firstly, you need to book a free 25-minute test class, so I can gain an understanding of your Spanish level and to talk about your needs and a study plan. Secondly, if you like you can select your future classes on the ‘book your classes’ page. Classes are paid in advance. You can complete payment by bank transfer, credit card or your PayPal account. Select a pack from “Book your classes” and, after making the payment, you will receive a confirmation email with your user and password to your Student Area. Once you access it, all you have to do is choose the days and times for your classes in your schedule. That is not a problem. You can select the option “Pay by card” at the PayPal page. Selecting this option you will not need to create a PayPal account to make the payment. Can I choose the days and time? Yes, you can do so at the ‘book your classes’ page. Please bear in mind the local Spanish time and that of your country. The times of the class schedule are in Central European Time. If I cancel the classes that I have paid for, do I get my money back? If there is just cause, you will be reimbursed for the amount corresponding to the classes that you have not consumed, however, you are liable for any bank fees. The study materials are free both for classes as for homework. You only pay for the classes. If a student prefers to use a textbook, they will bear the cost of purchasing the book on their behalf. I only give classes to students over 17 years of age. Can I take classes at any level of Spanish? I do not offer classes at Breakthrough level, because I believe the student should have some prior knowledge of Spanish for online teaching. However, we can always do a refresher of the contents of Breakthrough A1 level. Yes, during the classes I will be solely and exclusively with you. Is it possible to receive Spanish business classes? Classes do not expire. You can consume them whenever you want. Can I speak in my mother tongue if I don't understand something? It is best to make an effort. We will always speak in Spanish. I assure you that it is best for your learning process. If I want to take a number of classes other than those offered in the packs or in a different timetable, is it possible? Yes, all you have to do is write to contacto@aprendeconcarmen.es and talk about it. If you need to cancel a class and change the day or time, send an email to contacto@aprendeconcarmen.es up to 24 hours before the class is set to start, so you don’t lose it. We will simply change the day and time to another that best suits you. What happens if I don't connect for a class? If you have not given prior notice up to 24 hours in advance, I will wait for 15 minutes, but if you don’t connect in that time, you will lose the class and it cannot be recovered. Your time is precious and mine is too. If I want to prepare for the DELE exam, how many classes do you recommend I take? I am a DELE examiner and, in my experience with other students who have passed this test, to achieve good results, I recommend that you take a minimum of 10 classes per week for 4-5 weeks prior to the test. But the more classes you take the better prepared you will be. Do you give in-person classes? Yes, I give one-on-one classes at my home in Salamanca (Spain). If you are interested, get in touch. Ohhhhh, I haven't found the answer I was looking for. What shall I do? 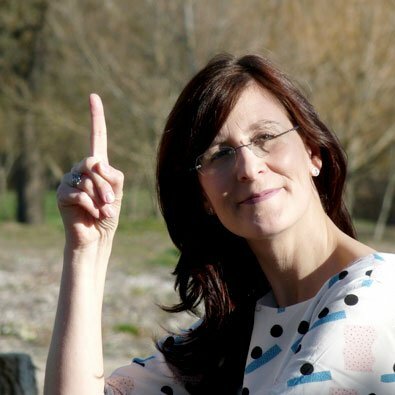 Write to me at contacto@aprendeconcarmen.es and I will answer you right away.